Gingrich has repeatedly run for the Republican Party’s presidential nomination, most recently in 2012, when he received the backing of major right-wing “pro-Israel” donors like Sheldon Adelson. Although he did not run for the 2016 GOP nomination contest, Gingrich was widely considered to be a potential running mate for Donald Trump, for which he reportedly “actively lobbied” the real estate mogul. Gingrich was widely considered a top prospect for a post in the Trump administration–including as Secretary of State–despite his many differences with the president-elect. During the early stages of the 2016 race, Gingrich frequently criticized many of the candidates, including both Ted Cruz and Trump. He once commented that one of Trump’s biggest achievements during the campaign had been to make Cruz look normal. After Trump locked up the nomination but failed to choose Gingrich as his running mate, the former congressman turned on Trump, calling him an “unacceptable” presidential candidate. “The current race is which of these two [Trump or Hillary Clinton]is the more unacceptable, because right now neither of them is acceptable,” Gingrich told The Washington Post. Gingrich expressed his support for the People’s Mujahedin of Iran—often known as the MEK, the abbreviation of their name in Persian—a cultish group which was once on the U.S. list of terror organizations and remains exiled extremely unpopular in Iran and in Iraq. The MEK is, however, widely embraced by neoconservatives. Gingrich advocated the threat of war not only with North Korea, but with Russia and China as well in order to confront the North Korean nuclear threat. “The Chinese in particular have got to cut him [Kim Jong Un] off. There’s all sorts of games being played. There are a lot of ways that the North Korean economy continues to financed by Russia and China, and I think those two countries have to understand they are risking a real war on their border if they allow this to continue,” Gingrich said. During Barack Obama’s presidency, Gingrich’s rhetoric grew increasingly strident, as he lambasted the president on everything from health care reform to foreign policy, and made wild accusations about elites abetting Islamic terrorists. In December 2015, after the massacre of 14 individuals in San Bernadino, California, by two individuals sympathetic to the Islamic State (ISIS), Gingrich argued that the Obama White House was, for ideological reasons, blind to the threat of “Islamic supremacists.” Along with co-author William Forstchen, Gingrich argued in an editorial after the attacks that gun-free zones at schools were absurd and suggested that “former military or law enforcement” figures carrying concealed weapons would protect school children from ISIS. After leaving Congress in 1999, Gingrich became a fellow at both AEI and the hawkish Hoover Institution, and joined the “leadership council” of the Clifford May-run Foundation for Defense of Democracies, a neoconservative pressure group founded in the wake of 9/11 to push for an expansive “war on terror.” He also served as a member of the Committee on the Present Danger, an advisor to the Committee for the Liberation of Iraq, and a Fox News analyst. Soon after taking office, President George W. Bush invited Gingrich to serve on the Pentagon’s Defense Policy Board, an advisory body heavily influenced by its neoconservative and hardline Republican members, including Richard Perle (as chair), James Woolsey, Ken Adelman, Eliot Cohen, and Dan Quayle. When appointed in November 2001, Gingrich was one of eight Hoover Institution fellows simultaneously tapped for the thirty-one-member board. During the immediate aftermath of the 2003 U.S. invasion of Iraq, Gingrich joined many of his AEI colleagues in blaming the State Department and then-Secretary of State Colin Powell for undermining the Bush administration’s foreign policy, and for Washington’s troubled relations with many U.S. allies. Gingrich has argued that the United States is confronting an existential threat in the war on terror. In a 2006 op-ed for the Wall Street Journal, Gingrich compared President Abraham Lincoln’s preparations for the Civil War to President George W. Bush’s efforts to prosecute the war on terror, arguing that where Lincoln succeeded, Bush was failing. Gingrich went on to call for regime change in Iran and North Korea and criticize the Bush administration’s handling of the war on terror. “I don’t think that the administration has yet come to grips with how big and complex this is,” he told news anchor Greta van Susteren. Gingrich’s primary claim to fame has been the 1994 “Contract with America,” a slate of Republican legislative proposals, which liberal critics called the “Contract on America.” In promoting the so-called contract, Gingrich used existential language similar to his current war on terror rhetoric—claiming, for instance, that “what is ultimately at stake … is literally the future of American civilization as it has existed for the last several hundred years.” Such language, scholar Shadia Drury wrote, is eerily reminiscent of the “sense of crisis” in Western civilization that political philosopher Leo Strauss, an early influence on Irving Kristol and many other neoconservatives, once promulgated. Distancing himself from the “democracy promotion” agenda of the George W. Bush years, Gingrich said that he would “look at the whole question of how we think of the governments in other countries.” He went on to suggest that a new military dictatorship in Egypt would be preferable to the country’s recently deposed Muslim Brotherhood government, which was democratically elected but later toppled by the military in the wake of anti-government demonstrations. Gingrich also expressed admiration for Republican Sens. Rand Paul and Ted Cruz, saying that they were “among the few people willing to raise the right questions.” The libertarian-leaning Rand Paul in particular, the son of Gingrich’s erstwhile GOP rival Ron Paul, has expressed concerns about U.S. interventions abroad and violations of civil liberties at home. “The establishment will grow more and more hysterical the more powerful Rand Paul and Ted Cruz become,” added. Gingrich’s presidential ambitions were met with considerable skepticism from both the left and the right. However, his campaign was buoyed by massive injections of cash from Sheldon Adelson, a controversial casino magnate and key financial backer of right-wing “pro-Israel” groups in the United States. In early 2012, Adelson contributed $5 million to a super-PAC supporting Gingrich, Winning Our Future, that spent lavishly on negative TV ads against rival presidential candidate Mitt Romney, which were widely believed to have helped Gingrich win the South Carolina primary. Adelson’s spouse, Miriam, followed up with an additional $5-million donation to the PAC aimed at influencing the 2012 Florida primary. Gingrich’s numerous personal scandals, which appear to contrast sharply with his vociferous promotion of “family values,” have also spurred skepticism. Several rightist commentators, like Peter Wehner, a contributor to the neoconservative flagship Commentary, highlighted Gingrich’s past marital infidelities as a significant hurdle for his nomination prospects. In June 2017, Gingrich published Understanding Trump, a book devoted to praising and whipping up support for the president he once ridiculed. Talking Points Memo, “Newt: Obama Foreign Policy Based On ‘Fantasy,’ ‘Could Get An Awful Lot Of People Killed’,” http://tpmlivewire.talkingpointsmemo.com/2010/04/newt-obama-foreign-policy-based-on-fantasy-could-get-an-awful-lot-of-people-killed-video.php. Newt Gingrich, “John Kerry and lies about Iran,” Washington Times, July 21, 2015, http://www.washingtontimes.com/news/2015/jul/21/newt-gingrich-john-kerry-and-lies-about-iran/. Newt Gingrich, “Gingrich: No Cordoba at Ground Zero,” Renewing American Leadership, July 21, 2010. Richard Cohen, “Newt Gingrich, pushing prejudice at Ground Zero,” Washington Post, August 3, 2010. Justin Elliott, “Newt Gingrich fund-raises on anti-mosque effort,” Salon.com, The War Room, July 30, 2010, http://www.salon.com/news/politics/war_room/2010/07/30/gingrich_fundraises_on_mosque. Newt Gingrich and William Forstchen, “Will Gun Free Zones Protect Our Children From ISIS?” Washington Times, December 4, 2015, http://www.gingrichproductions.com/2015/12/will-gun-free-zones-protect-our-children-from-isis/. Newt Gingrich, “No Mosque at Ground Zero,” Human Events, July 28, 2010, http://www.humanevents.com/article.php?id=38282. “Fox on the Record with Greta van Susteren,” Fox News, September 14, 2006. Shadia Drury, Leo Strauss and the American Right (New York: St. Martin’s Press, 1997), pp. 21-22. Ralph Hallow, “Newt Gingrich sees major Mideast mistakes, rethinks his neocon views on intervention,” Washington Times, August 4, 2012, http://www.washingtontimes.com/news/2013/aug/4/newt-gingrich-rethinks-neoconservative-views/print/. RealClearPolitics, ” Gingrich: Republican Party Needs A Debate On National Security,” August 2, 2013, http://www.realclearpolitics.com/video/2013/08/02/gingrich_republican_establishment_is_growing_hysterical.html. Mollie Reilly, “Newt Gingrich Rethinks Stance On U.S. Military Interventions,” Huffington Post, August 4, 2013, http://www.huffingtonpost.com/2013/08/04/newt-gingrich-military-interventions_n_3705208.html. Hayes Brown, “Newt Gingrich Abandons Neocons, Joins Rand Paul In GOP Foreign Policy Civil War,” Think Progress, August 5, 2013, http://thinkprogress.org/security/2013/08/05/2410891/gingrich-neocon-flip/. Fox News, “Exclusive: Gingrich Comes Out Swinging Against Obama in First Interview as Presidential Candidate | Hannity,” May 11, 2011, http://www.foxnews.com/on-air/hannity/transcript/gingrich-comes-out-swinging-against-obama-after-announcing-presidential-bid. Nicholas Confessore, ‘Super PAC’ for Gingrich to Get $5 Million Infusion, New York Times, January 23, 2012, http://www.nytimes.com/2012/01/24/us/politics/super-pac-for-gingrich-to-get-5-million-infusion.html. Quoted in Mondoweiss, “Gingrich says his backer’s ‘central value’ is Israel (and NBC drops the subject),” Mondoweiss, January 18, 2012, http://mondoweiss.net/2012/01/gingrich-says-his-backers-central-value-is-israel-and-nbc-has-no-more-to-say-on-the-subject.html. Amy Bingham, “GOP Candidates Praise Gadhafi’s Death, Opposed U.S. Role,” ABC News, The Note, October 20, 2011, http://abcnews.go.com/blogs/politics/2011/10/gop-candidates-praise-gadhafis-death-opposed-us-role/. 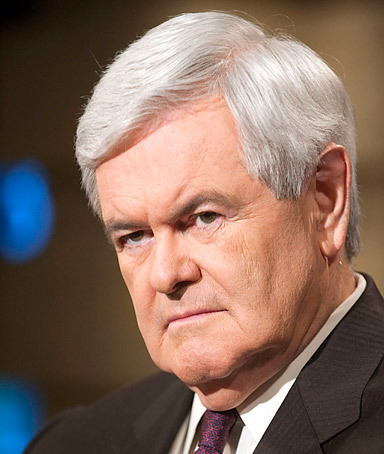 Orlando Sentinel, “Gingrich Reacts to Gaddafi’s Death, Troop Withdrawal,” http://www.orlandosentinel.com/videogallery/65573339/News/Newt-Gingrich-reacts-to-Gaddafi-troop-withdrawal. Ben Armbruster, “Gingrich Suggests Obama Is Ushering ‘Defeat’ In Iraq, Two Days After Saying He’s ‘Right’ To Withdraw,” Think Progress, October 24, 2011, http://thinkprogress.org/security/2011/10/24/351971/gingrich-suggests-obama-is-ushering-defeat-in-iraq-two-days-after-saying-hes-right-to-withdraw/. Peter Wehner, “On Infidelity and Presidents,” Commentary, Contentions, March 8, 2011 http://www.commentarymagazine.com/2011/03/08/on-infidelity-and-presidents/. David Frum, “David Frum: Family values and the Newt Gingrich question,” National Post, March 9, 2011, http://fullcomment.nationalpost.com/2011/03/09/david-frum-family-values-and-the-newt-gingrich-question/. The Brody File, “Newt Gingrich tells The Brody File he ‘felt compelled to seek God’s forgiveness’” Christian Broadcasting Network, March 8, 2011, http://blogs.cbn.com/thebrodyfile/archive/2011/03/08/newt-gingrich-tells-brody-file-he-felt-compelled-to-seek.aspx. Felicia Sonmez, “Gingrich ends campaign; no outright endorsement for Romney,” Washington Post, May 2, 2012. Matthew Continetti, “Eye of the Newt,” Weekly Standard, September 12, 2006. Ryan Reilly, ” Plane Rides Will End, But Newt Inc. Will ‘Aggressively Move Forward’ After Gingrich Announcement,” TPM, May 11, 2011, http://tpmmuckraker.talkingpointsmemo.com/2011/05/newt_inc_to_aggressively_move_forward_after_gingrich_announcement.php?ref=fpa. AEI Books, Winning the Future: A 21st Century Contract with America, http://www.aei.org/book/803. AEI Books, Drill Here, Drill Now, Pay Less, http://www.aei.org/book/964. Review of Newt Gingrich’s Rediscovering God in America, Publishers Weekly, June 26, 2006. Quoted in Andy Kroll, “Newt Gingrich’s Muslim Brotherhood Fearmongering,” Mother Jones, February 10, 2011,http://motherjones.com/mojo/2011/02/newt-gingrichs-muslim-brotherhood-fearmongering. Newt Gingrich and William Forstchen, “Will Gun Free Zones Protect Our Children From ISIS?” Washington Times, December 4, 2015,http://www.gingrichproductions.com/2015/12/will-gun-free-zones-protect-our-children-from-isis/. New Gingrich, “Sleepwalking into Disaster,” Washington Examiner, May 22, 2009. Talking Points Memo, “Newt: Obama Foreign Policy Based On ‘Fantasy,’ ‘Could Get An Awful Lot Of People Killed’,”http://tpmlivewire.talkingpointsmemo.com/2010/04/newt-obama-foreign-policy-based-on-fantasy-could-get-an-awful-lot-of-people-killed-video.php. Justin Elliott, “Newt Gingrich fund-raises on anti-mosque effort,” Salon.com, The War Room, July 30, 2010,http://www.salon.com/news/politics/war_room/2010/07/30/gingrich_fundraises_on_mosque. Newt Gingrich, “Bush and Lincoln,” Wall Street Journal, September 7, 2006. Ralph Hallow, “Newt Gingrich sees major Mideast mistakes, rethinks his neocon views on intervention,” Washington Times, August 4, 2012,http://www.washingtontimes.com/news/2013/aug/4/newt-gingrich-rethinks-neoconservative-views/print/. RealClearPolitics, ” Gingrich: Republican Party Needs A Debate On National Security,” August 2, 2013,http://www.realclearpolitics.com/video/2013/08/02/gingrich_republican_establishment_is_growing_hysterical.html. Mollie Reilly, “Newt Gingrich Rethinks Stance On U.S. Military Interventions,” Huffington Post, August 4, 2013,http://www.huffingtonpost.com/2013/08/04/newt-gingrich-military-interventions_n_3705208.html. Hayes Brown, “Newt Gingrich Abandons Neocons, Joins Rand Paul In GOP Foreign Policy Civil War,” Think Progress, August 5, 2013,http://thinkprogress.org/security/2013/08/05/2410891/gingrich-neocon-flip/. Fox News, “Exclusive: Gingrich Comes Out Swinging Against Obama in First Interview as Presidential Candidate | Hannity,” May 11, 2011,http://www.foxnews.com/on-air/hannity/transcript/gingrich-comes-out-swinging-against-obama-after-announcing-presidential-bid. Nicholas Confessore, ‘Super PAC’ for Gingrich to Get $5 Million Infusion, New York Times, January 23, 2012,http://www.nytimes.com/2012/01/24/us/politics/super-pac-for-gingrich-to-get-5-million-infusion.html. Quoted in Mondoweiss, “Gingrich says his backer’s ‘central value’ is Israel (and NBC drops the subject),” Mondoweiss, January 18, 2012,http://mondoweiss.net/2012/01/gingrich-says-his-backers-central-value-is-israel-and-nbc-has-no-more-to-say-on-the-subject.html. Amy Bingham, “GOP Candidates Praise Gadhafi’s Death, Opposed U.S. Role,” ABC News, The Note, October 20, 2011,http://abcnews.go.com/blogs/politics/2011/10/gop-candidates-praise-gadhafis-death-opposed-us-role/. Peter Wehner, “On Infidelity and Presidents,” Commentary, Contentions, March 8, 2011http://www.commentarymagazine.com/2011/03/08/on-infidelity-and-presidents/. David Frum, “David Frum: Family values and the Newt Gingrich question,” National Post, March 9, 2011,http://fullcomment.nationalpost.com/2011/03/09/david-frum-family-values-and-the-newt-gingrich-question/. The Brody File, “Newt Gingrich tells The Brody File he ‘felt compelled to seek God’s forgiveness’” Christian Broadcasting Network, March 8, 2011,http://blogs.cbn.com/thebrodyfile/archive/2011/03/08/newt-gingrich-tells-brody-file-he-felt-compelled-to-seek.aspx. Ryan Reilly, “Plane Rides Will End, But Newt Inc. Will ‘Aggressively Move Forward’ After Gingrich Announcement,” TPM, May 11, 2011,http://tpmmuckraker.talkingpointsmemo.com/2011/05/newt_inc_to_aggressively_move_forward_after_gingrich_announcement.php?ref=fpa. Gingrich on the Campaign Trail?